Heat oven to 350°F. In large bowl, break up cookie dough. Add chopped peanut butter pieces; knead into dough with hands until well combined. Reshape dough into 12-inch log. Using sharp knife, cut log into 24 (1/2-inch) slices. Place 1 peanut butter cup candy on each slice of dough; wrap dough around candy. With hands, shape dough into balls. On ungreased cookie sheets, place balls 2 inches apart. Bake 10 to 12 minutes or until edges are light brown. Cool 2 minutes; remove from cookie sheets to cooling racks. 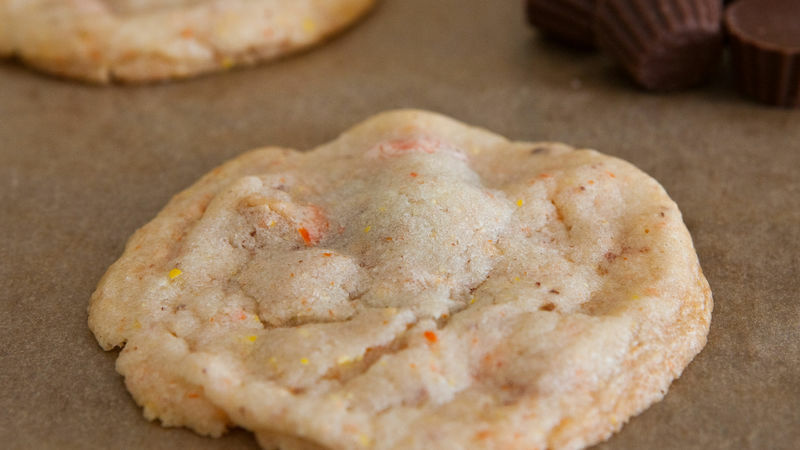 Candy-coated chocolate candies can be substituted for the peanut butter pieces in this recipe. Milk chocolate candy bars can also be substituted for the peanut butter cups unwrapped minis candies. For best results, run cookie sheet under cold tap water to cool before baking each batch.